Indian cricket team skipper Virat Kohli has recently shared a video of wife Anushka Sharma scolding a man who was littering the roads. In the video, Anshuka can be heard losing her cool on the man sitting inside the luxury car and throwing the garbage on the streets. 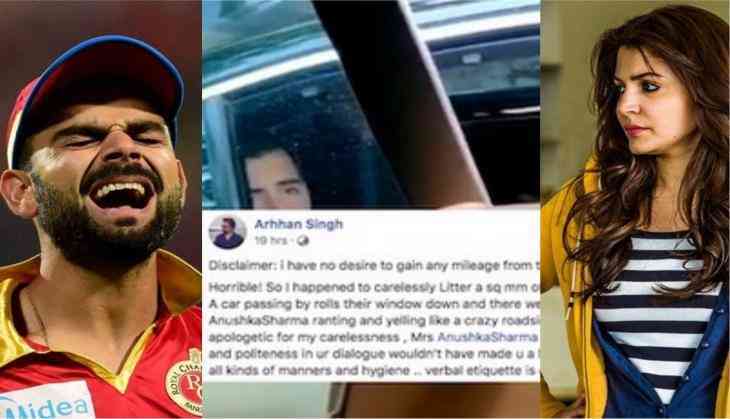 The man identified as Arhhan Singh has finally come out and opened up over Anushka Sharma's video of scolding him that went viral. The man took Facebook and wrote, "The garbage that mistakenly went out of the window of my luxury car...was way less than...garbage that came out from your mouth." He also slammed Anushka's husband and India cricket team captain Virat Kohli while writing that he has a "trashy mind" for recording and posting the video online. Now thats some SERIOUS TRASH!!! Cricketer Virat Kohli's viral video of his wife Anushka Sharma schooling a man for throwing garbage on the road drew mixed reactions on Twitter.